We smiled when we saw the setter was Nutmeg. She can be counted on to give the solver a fair chance and to provide some fine surface readings in well-set clues, though there was a bit of muttering about misprints. It is rare to find a crossword with a misprint in the definition part of every clue without some of them being mildly forced or rather clunky. And the habitual Listener setter’s dose of alcohol? Nutmeg abstained in a ladylike way, producing tea instead -‘In Darjeeling, perhaps an Indian might boil it (5)’ We used CHA round AN giving us CHANA or a ‘chick-pea’. However, we had a full grid before we understood what those strange extra letters were that were appearing round SADDLE, LAZY DAISY and BUTTONHOLE produced by the corrected misprints. What a lovely final touch. “Of course” said the other Numpty, “we have HOUR, ERA and PERIOD surrounding those stitches. Many thanks to Nutmeg for a challenging and entertaining solve. We smiled when we saw that the crossword was by Nutmeg (hers always have attractive themes and entertaining clues). Then our smiles changed to gloomy grimaces of consternation. Surely not Printer’s Devilry! … and misprints too. We know that PD clues are either loved or loathed with the second camp of solvers being significantly larger. The problem is that those are a kind of advanced hypothetical word search with no helpful definition appearing in the clue. The solver has to attempt to spot the most likely place in the deviled sentence for the solution word to have been removed, and with Nutmeg’s skill, those are likely to have been well disguised. Later we found that the tipple is ALCOPOPs – ‘Inspector found venAL COP OPerating protection racket (7)’ so cheers, Nutmeg. I think that clue shows how well some of these PDs were hidden and we frequently found ourselves working backwards from potential solutions, to fit the letters into the clues. WINCEY, for example, had to go into ‘In the 19th Century, a felon left for India (6)’ It makes perfect sense, as does ‘a feW IN CEYlon left for India. There was Nutmeg humour too. ‘Not getting enough? Chat up another dish! (4)’ … but it was not rumpy-pumpy that was lacking this time. ‘Not getting enough? ChAPS Eat up another dish. We solved steadily and our initial dismay turned to pleasure as those misprint clues coupled with the PD led to a fairly speedy grid fill. RALPH, as the printer’s devil soon appeared but we had completely missed the thematic hint in the final clue, ‘Model satanist continued his work (4)’ Model sat anD ARTist continued his work. We had a full grid with just one clue unsolved. Was TANGI or HANGI going to fill 18 across? However, the corrected misprints were obligingly giving us SHADE SIX SYMMETRICAL DEVILS and at once SATAN appeared, resolving that final doubt. We back-solved to another delightful example of PD that was totally thematic. ‘Being an easily tempted Christian saTAN GIves me a lot of trouble (5)’. We had the hint that the devils were symmetric so there was no frustrating grid stare as FIEND, DAIMON, BELIAL, CLOOTS and HORNIE came into view. Graphically thematic too, not only is there a Christian cross but also an upside down satanic one! Lovely setting; many thanks to Nutmeg. Last year’s Nutmeg concerned William Sherwood and his comment about mendacious piscators (“are fishermen all liars?”). This week, we had a mixture of misprints and printer’s devilry clues. “Well,” said I (to myself), “a long time since we’ve had PDs in a Listener.” I proceeded with my solve, and only when writing this blog did I look to see exactly how long. It seemed that it had been only two years — Dragon’s PD about decimalisation. I’d have put it at ten or more! OK, before that, we had to go back to 2010 and Pointer’s Double Devilry. Anyway, this week’s Nutmeg puzzle turned out to be a real toughie for me. Obviously the mixture of two clue types didn’t help, but the lack of a helpful definition in the PD clues didn’t help even more. I started on the acrosses… and then gave up on them after a dozen or so since not one entry had been slotted in the grid. I tried the downs and they were much more forgiving. I use the qualifier “much more” somewhat loosely. After an hour, I had just 14 entries in the grid, over half of them being from PD clues. A short while later and I had •A•P• for the unclued 25ac, and it was obvious that RALPH, the printer’s devil himself, would appear there. I really should have got that after reading the preamble, although I suppose it could just as easily have been AFRIT. After a couple of quite long sessions, the grid was complete. I suppose I wasn’t surprised to make heavy going of two clues: 18ac Being an easily tempted Christian[,] sa[TAN GI]ves me a lot of trouble (5), and 30ac Religious vigilantes nabbed Sikh in T[URBAN ER]ring (7) — the first for a word I’d not heard of, and the second for a comparative that I don’t use very often (and with a clue that reads a bit odd). Also, I wasn’t helped by having it in my head for a long time that 29dn In the 19th century, a fe[W IN CEY]lon left for India (6) was a misprint clue! At last though, the corrected misprint letters spelt out Shade six symmetric devils. 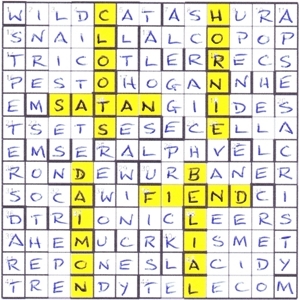 SATAN and FIEND appeared in rows 5 and 9, and CLOOTS, HORNIE, DAIMON and BELIAL in four columns. Over at the Inquisitor, John H has asked for comments on whether solvers would like to see Printer’s Devilry, Playfair or even numerical puzzles there. I wrote that I would not be averse to any of them, but that Nutmeg had somewhat put me off PDs. Still, we all have our pet hates and peeves, and I probably just got out of bed the wrong side! Thanks for a tough workout, Nutmeg. 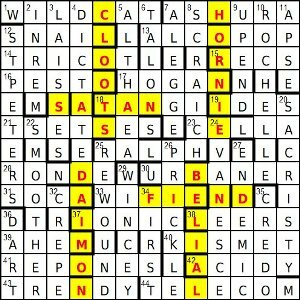 *OK, so it was actually called Devilry: the aim in exactly half of the clues was to add the characters of a(n unrelated) word to form a new word or phrase. And to stop this appearing too random, the expanded phrase made more sense than the original shorter clue. So perhaps D(EVIL)RY sort of works! Many of those new phrases were delightful in their own right and, if I understand it correctly (I am new to Printer’s Devilry (PD) puzzles having only ever solved one or two before), making a plausible phrase turn into a more apposite one seems to very much be the skill required of the setter. I tried to write just one good PD clue and failed miserably – if you haven’t ever done so then give it a try. You are almost bound to do better than I did! Of course, Nutmeg feels that ‘simply’ having all clues in this format would be far too easy, so she chooses to randomly intersperse them with standard cryptic clues! Not only that, Nutmeg clearly feels that would be too easy too, and so makes a misprint in each definition of these second type of clues!! And, naturally, the solver has no idea initially which are which. Easy, eh? It looked like it would be (wor)K plus an anagram of TIMES*. The word was clearly KISMET but where was the misprint? Ah yes, There’s no escaping it – fate, that is – so the corrected letter is I. Only 22 left to find! Only 22 PD clues left to find as well! The final instruction from the 23 misprints was to SHADE SIX SYMMETRIC DEVILS. I found four quickly, with the last two taking just a few moments longer. Another clever feature of Nutmeg’s grid was the symmetry of these ‘devilish’ words. In summary, a great grid with some hard but very fair intermixed clues. Thanks Nutmeg!